Yamari Validation System is designed to automatically validate that the autoclaves used in pharmaceutical companies are processed at the specified temperatures and eliminates opportunities for recording false data. 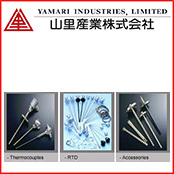 BB 660/25.5 is the Standard Platinum Resistance Thermometer jointly developed with National Institute of Advanced Industrial Science and Technology (AIST/NMIJ) as an interpolation device for measurements from -1900C to approximately +6600C. BB(S) 962/2.5 is the Standard Platinum Resistance Thermometer jointly developed with National Institute of Advanced Industrial Science and Technology (AIST/NMIJ) as an interpolation device for measurements from +6600C to approximately +9620C. These cells were jointly developed with National Institute of Advance Science and Technology (AIST/NMIJ) to realize the defining points of ITS-90. Cells are designed specifically to realize the liquid-solid equilibrium of certain high-purity metal elements.